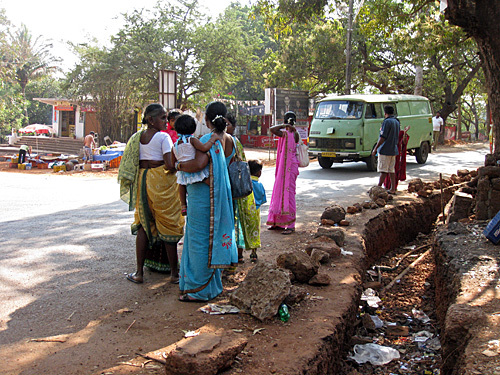 Buses are the most important means of transport in Goa. Even though the buses run frequently, they are most of the time overcrowded. 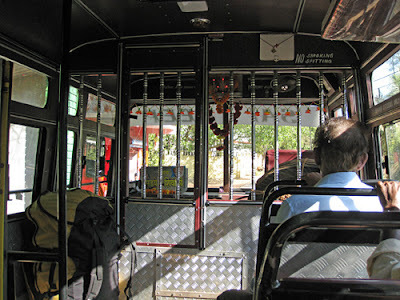 Local buses are never air-conditioned. There is no need because the windows are open. A grid separates the driver from the passengers. The first two seats behind the driver are usually reserved for women. There is always a whole bunch of passengers waiting at the bus stop. When the bus arrives, the crowd pushes and shoves their way in. If you want to hop on as well, all you can do is join the bustle. Bus stops are my favourite places because they offer brilliant photo opportunities. The bus is waiting at the bus stop for its return journey. The bus driver has not arrived yet. At the first stop there are still enough seats. There is a door in the grid. Sometimes passengers are alowed to sit next to the driver. If you have bulky luggage, it is also put in the front. This young man was waiting all by himself. At first I didn't know that he was actually waiting for a bus. Bus stops in India are seldom indicated. I love to study the saris of the ladies when I am waiting at a bus stop. When the bus finally arrived, it wa so full that I decided to wait for the next one. The same bus stop as in the photo above. 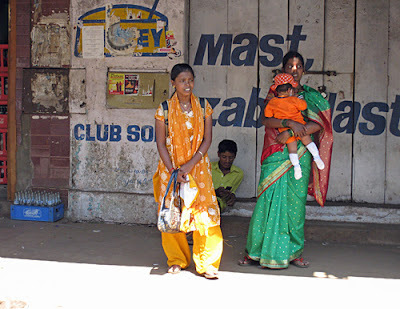 This time one of the ladies had tucked her sari in between her legs. It makes getting on the bus far easier. Only two women at this stop waiting in the shade. They child is not very small and seemed quite heavy to me, but her mother carried her all the time. The bus was very full, she had to stay all the way (about 30 minutes), still carrying the child. 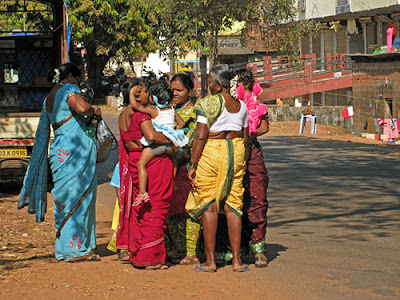 When I arrived at the bus stop, this bunch of ladies had been waiting for some time. The two girls standing on the left are in school uniform. The three ladies sitting on the step had been shopping. When the bus arrived, it was chock-ful, but we all could just squeeze in. 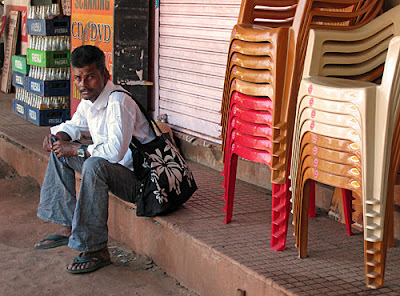 Waiting for the bus in Goa is quite an experience.